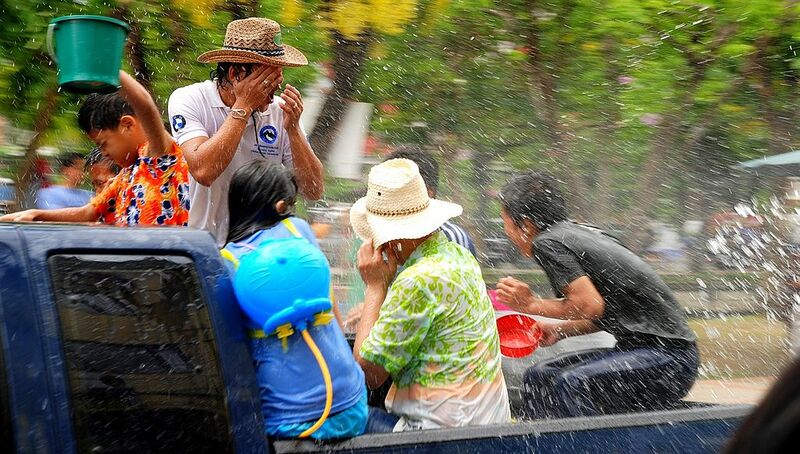 Songkran is the very mad and wet celebration of Thai New Year which takes place from 13-15 April. 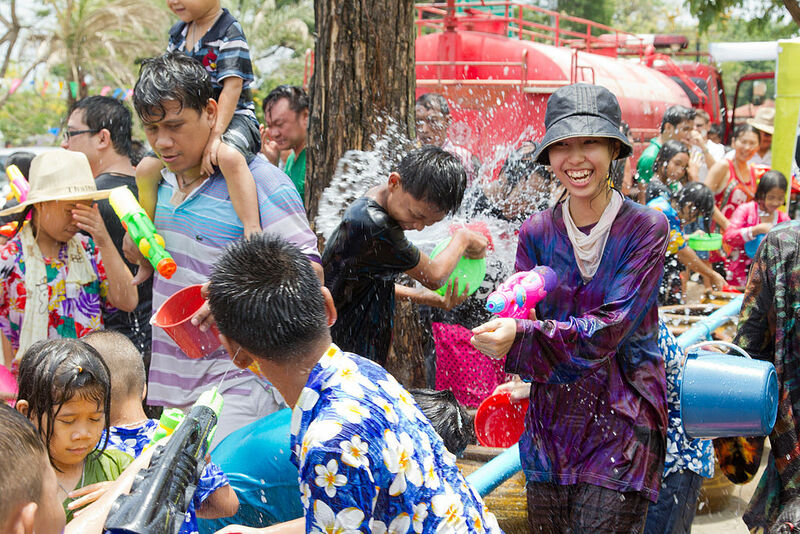 The Songkran festival grew from the original unassuming concept of washing the hands of family elders, into today’s modern mega party. Every year, for a hot week in April, Thailand’s northern city of Chiang Mai undergoes it’s metamorphosis from laid back garden city to the full blown party capital of Thailand. 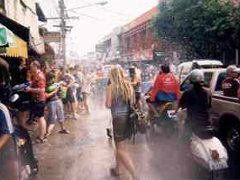 The city has become famed for its wild and wet celebrations of Songkran, which centre around the moat surrounding the old city. With less than two weeks to go the excitement is already starting to build. The official Songkran holiday runs from tomorrow, Friday 13th April 2018 until Sunday 15th April. However, around the moat and Thapae gate, which is the epicentre of Songkran, the drenching usually starts a day or two early, which it certainly will this year with a weekend preceding the main holiday. 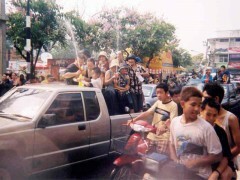 During the main days of Songkran a constant parade of vehicles, slowed to walking pace, fill the inner and outer moat roads. Monday 16th and Tuesday 17th are also public holidays as Songkran falls over a weekend, however the water throwing should finish on Sunday. For the un-initiated, Songkran is the annual Thai New Year festival. What started as a Bhuddist tradition of pouring water on Bhudda statues and the hands and feet of elders to cleanse and show respect, has now become anything but respectful. For several days it seems almost everyone is out on the streets attempting to drown each other in as much water as possible. Some station themselves along roadsides and get their ammunition from the nearest hosepipe. Others lounge in the back of pick-up trucks. Loaded with a large drum of water, plenty of buckets, high powered water pistols and don’t forget the beer! They then maraud through the city engaging in smile filled water combat with anyone and everyone. Nobody is safe! Don’t think that wearing a suit and carrying a briefcase will protect you from a drenching. Even uniformed policemen get soaked! But, with the heat of April, being soaked in water all day seems quite pleasant. In Chiang Mai, the local population is joined by throngs of tourists as well as many Thais from surrounding towns or returning home for the holiday from Bangkok, add to them the throngs of tourists who come to join in the fun and the city is packed. Whilst Songkran is a big party, the night-life is often somewhat subdued as everyone is all partied out during the day, especially those drinking under the hot sun. Quiet nights out at restaurants and a few drinks are often the most popular choices. 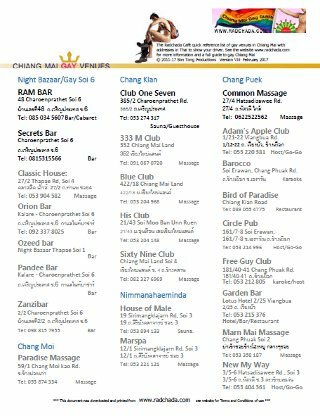 Though be aware that, with many visitors in town, and the staff having often been out playing Songkran all day, the level of service in some places may not be at its best.